When Emma married CFE Witzel, she became the daughter-in-law of Anna Wilhemia Wreden, wife of John Frederick Witzel. Unlike the Belgian De Booms, the Witzels came from Oldenberg and Wredens from Lintig in Germany, which occasionally led to socially awkward moments between the European-born generation at holiday gatherings. It also brought Emma into the brewery business, known to family as the ‘Wreden Brewery.’ The formal name was the ‘Washington Brewery’ and later the “Claus Wreden Brewing Company,’ which was eventually purchased by the Acme Brewery. 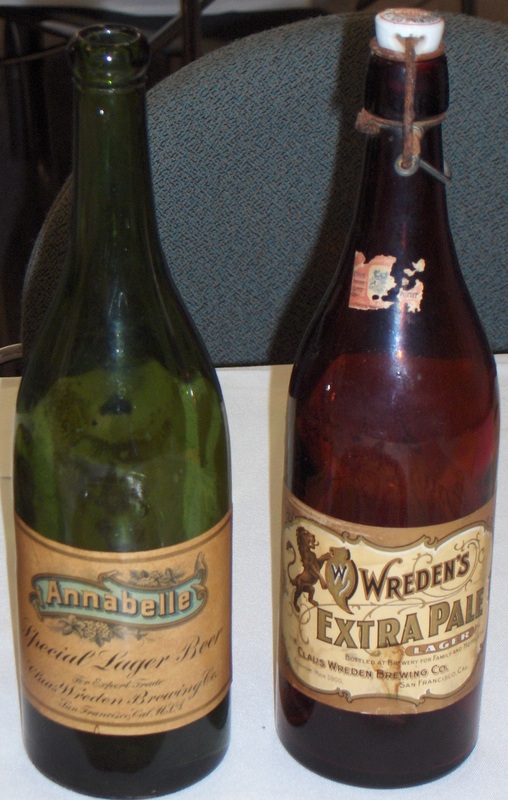 The Claus Wreden Brewing Company sold ‘Annabelle Lager’ and ‘Wreden’s Extra Pale Lager,’ both steam beers. 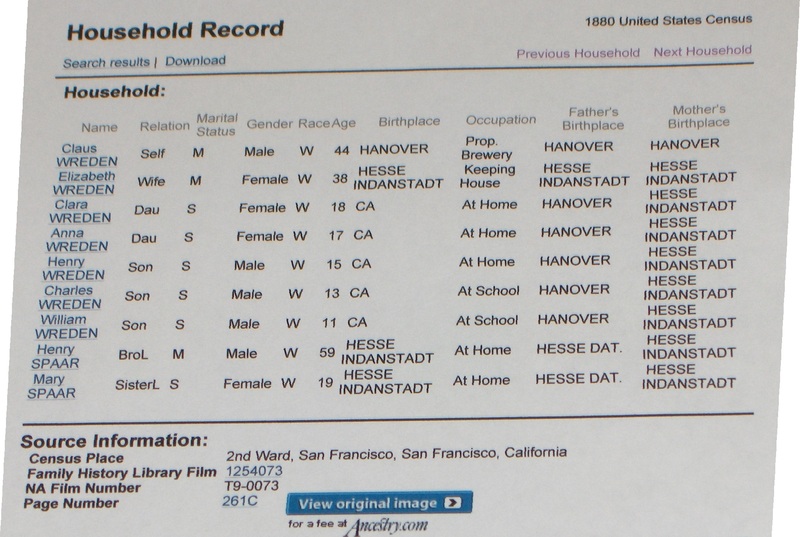 A very happy “Roundup” of the extended Wreden clan, including several Witzels (decendants of Anna and her father Claus Wreden) was organized by Don Nevins in Paso Robles in 2005. Don displayed stunning posters of the Wreden history and arranged for Tom Jacobs, an expert on early San Francisco breweries, to speak and to display artifacts. My photos of the event and Don’s poster quotes below are used with his gracious permission. “Claus Wreden arrived in New York on October 1, 1853 on the ship named ‘Elizabeth.’ He was 17 years old. Claus started the naturalization process on May 19, 1855 in New York and was admitted as a US citizen September 13, 1859 in San Francisco (per Kathleen Weston’s research). By this date he would have been a California resident for a year.” Don Nevins found Claus’ brother, “Henry Wreden (age 21) arriving in New York , on May 24, 1864 with an ultimate destination of San Francisco.” (Letter to Terry & Diana Witzel dated Jan. 26, 2004). According to Don, by 1867-1868, Claus is listed as co-owner and his brother Henry as an employee of the Washington Brewery. 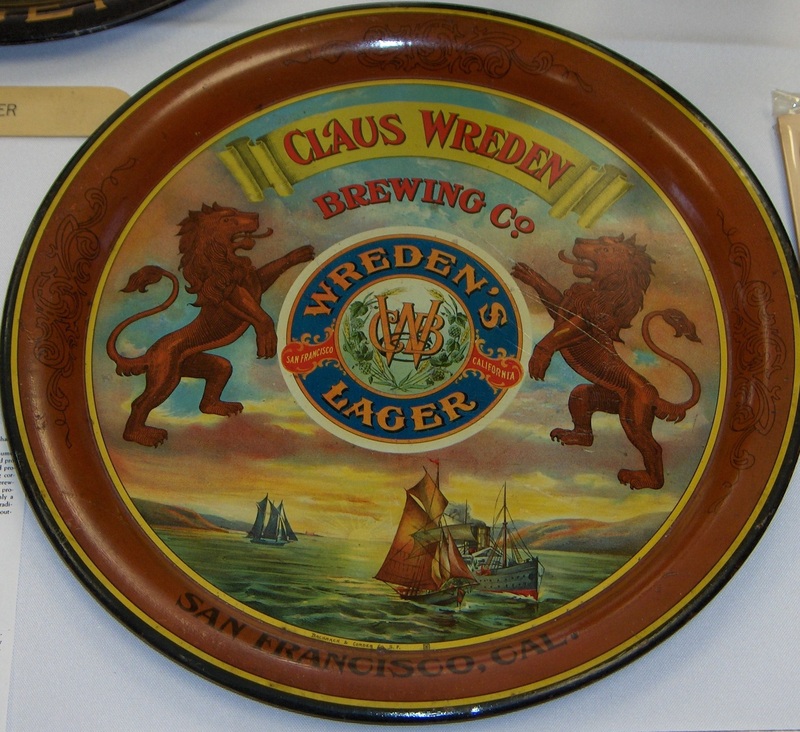 On February 7, 1899 the Claus Wreden Brewing Company was incorporated. At some point Henry sold his interest to his nephew, Henry M. Wreden, who became President. Frank J. Veen was Secretary and married into the family. Both are listed in the 1900-1902 edition of Great Men of California under ‘Brewers.’ They are buried in the Witzel – Spaar –Wreden – Veen family plot at Olivet Memorial Park, Colma. After Claus’ brother, Henry, sold his interest in the brewery, he bought ranching property in San Luis Obispo County. Recently several of brother Henry’s descendants have been interviewed for the Carrisa Plains Oral History Project by the author Craig Deutsche. Interviewees include Rita Godward, Jim Liston, Don Nevins, Chuck and Fran Pritchard, Douglas Wreden, his daughter Carissa, Paula Wreden and William P. Jr. (Bo) Wreden, among others. Copyright to the material has been given to Cal Poly where audio CDs and transcripts of the oral histories are on deposit in Special Collections, Kennedy Library, Cal Poly, San Luis Obispo. Copies are also on deposit at the San Luis Obispo History Center, San Luis Obispo, the Taft Junior College Library, Taft, and at the Bancroft Library at UC Berkeley. In 2013 Craig published Another Place and Time: Voices from the Carrisa Plains based on oral history interviews. The book includes several pages on Douglas Wreden and his family. Not all Wreden family members who gave oral histories are mentioned in the text or the appendix. Paula, for example, was not interviewed until after Craig’s book was published.